What attracted you to working on The Balvenie's Craftsmen's Dinner campaign? Last year's campaign was a success in terms of the number of viewers and the feedback on my enthusiasm, because I enjoyed every moment of it. Being passionate as a chef and as a restaurateur ties in beautifully with all the other crafts we discovered, and to find out what makes all these other craftsmen tick was a really enjoyable part of the job. We've gone slightly off-piste with Morgan cars this year, but it is obviously a great craft nonetheless – to see them work, these are old-fashioned skills. Is the idea of craftsmanship in vogue in the food and drink industry? Are people talking about it more? I think it's more an appreciation and an understanding of going back to these core skills – at the end the day, a craft is a skill you have to learn and you have to be passionate about. More and more we're seeing that; people are moving away from big brands and big, industrialised food products, towards an appreciation for something that has taken a little bit more time to make but has got that feeling of craft instilled in it. As a chef, does it surprise you that craftsmanship can seem a relatively new idea in other industries? I suppose for efficiency and for price, industrialisation and uniformity has taken over. But I genuinely feel that there's a movement towards an appreciation of true craft. That's why the campaign was such a success, and that's why we're doing a second series. There is this quest for understanding what goes into a craft, and to make it more accessible as well. If you take Wildes Cheese, for example: Tottenham's the last place on earth you'd think they'd make cheese, but these two guys are passionate about what they do, and passionate about their product. They originally thought of going to Wales, out of the big city, because there's all the abundance of wonderful dairy. But it dawned on them after the riots in 2011 that actually, why not do it in Tottenham? It's their home town; their stomping ground – there's absolutely no reason why it shouldn't happen. And they're actually bringing in the whole community of Tottenham: they hold charitable events for kids with learning difficulties, they have women's institutes coming in, the elderly come in and they make cheese. So it's not just about craft – it actually brings something to the community, which I think many craft businesses do. It's almost a byproduct of what they do. Is it easier to create a dialogue around products when they're local? It is. And that is truly local: it's Tottenham cheese. But it's the same with Bermondsey Street Bees: you go up onto the roof, where you're almost within spitting distance of the Shard, and you think 'this is just bonkers'. Then you taste the honey and it's mindblowing. How important is it for you that products carry a sense of place? I think it's very, very important, and the customer realises that as well. When you're reading a menu at a restaurant and you see that, for example, the honey comes from Bermondsey, or one of the cheeses comes from Wildes Cheese in Tottenham, it makes it real and it's an affirmation that we care – that we're taking pride and we care about where we source our food, and what we put on the plate. For me, that's incredibly important. And what about the idea of what you make not being constrained by time? The bread is a great example: it takes 24 hours, sometimes 48 hours, to make a loaf of bread at Wooster's Bakery because it's a slow ferment. Industrialised bread is risen and made within a couple of hours, so it is a totally different product and you can taste the difference. But that's not all it's about, for me: it's about understanding the story behind it, and all of that craft that goes into it. At Wooster's, he's got a windmill on his doorstep that he's passionately rebuilding. It'll take years to get it back up to scratch, to full speed, but that that's what he wants to do ultimately: grind his own grains and flours, and then make his bread from that. And the end product is sensational. We're going to be using his bread at The Langham. There's a dingy corner of the building, and we're going to break that down and open a pub there. We'll be using his bread, along with a lot of craft ingredients, hopefully mostly London-centric and British. In other news, you're celebrating the 50th anniversary of Le Gavroche. How special an achievement is that for you and your family? It's a major milestone. It's a huge milestone. When you think about exactly what's gone on in those 50 years: the food scene here in Britain in 1967 was pretty barren, and certain ingredients were simply not available. Who would have thought back then that one day there would be a cheesemaker in Tottenham? If I said that to my dad then he would have taken me off to an institution. We had a big lunch and invited along a whole gang of friends, mostly chefs. It was just a relaxed lunch, which didn't get too messy, thankfully. And then we had another one in April just for customers as well as two of the original backers who are still alive. They got bought out after the second year of operation, but they each put £500 into the business. If you think about 500 quid in 1967 – that would have been an awful lot of money. Want to know how Michel got on when he visited Wildes Cheese, Wooster's Bakery, Bermondsey Street Bees and Morgan? Check out the films on YouTube – four beautifully shot, behind-the-scenes glimpses of the Craftsmen’s operations, as well as a film that chronicles the final Craftsmen's Dinner at the Langham. 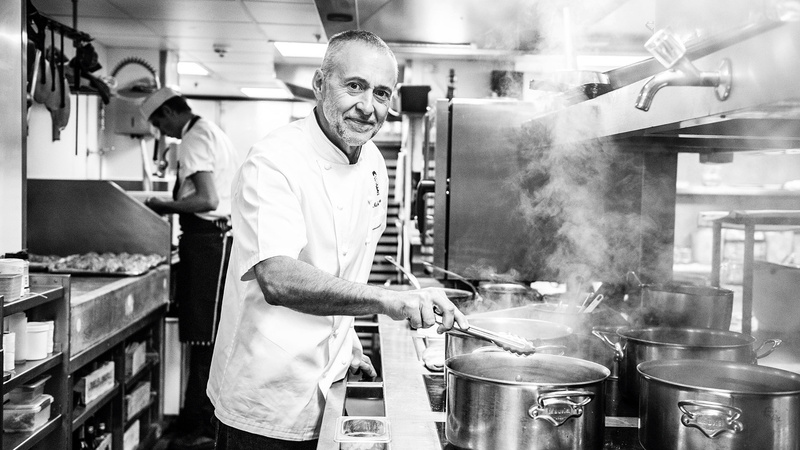 How has Le Gavroche stood the test of time in a world where the food scene is so fast-paced and ever-changing? I think the average lifespan of a restaurant in London is five or six years, or something like that, so it is a huge achievement – and that's without reinventing itself. I think the secret to that is evolution. You have to stay at the top of your game and stay true to your roots. You have to evolve, but not too much, so the customer doesn't find themselves somewhere completely different. That's very important, so you don't alienate your customers. We're getting a third generation of customers now; people taking their grandchildren here for the first time, saying "I remember when my dad took me here." It really is something special. How has the neighbourhood changed in that time? Mayfair is a strange one. I mean, when we first moved here in 1981 it was a bit of a red light district, believe it or not – very often you'd have ladies there waiting. It was not the best part of Mayfair – Shepherd's Market as well. But now look at it: Mayfair's been taken over by high-end restaurants and bars, and it's a completely different place. Around the corner by Seymour Street you've got some new-school restaurants popping up, so you can't have a set idea of a Mayfair crowd. Rent and rates in Mayfair are expensive, obviously, but you can definitely make it work. It has become a 'destination' area of London. There are a lot of great hotels around here, but it's not just the international customers that we attract in Mayfair: we also have a great following of British customers, people that travel from all over the UK just to come to London to see a show and have dinner.